Today we had some snacks in the kitchen, left over from a video shoot, so I rummaged through and found some Nutter Butters. After one bite I was reminded of two things. 2) They are like a crappier version of the much more delicious P.B. Crisps. P.B. 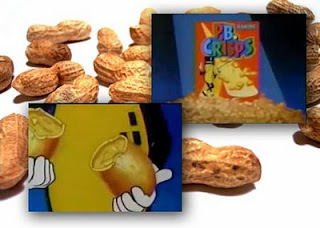 Crisps were a Planters product in the mid 90's that were absolutely delicious. I remember many days coming home from school and my mom would have my afternoon snack laid out for me so I could quickly grab it and go watch my favorite afternoon toon (probably around this time it would have been Animaniacs). Yet, like so many great snacks back then, they disappeared quickly and quietly. The Internet is relatively sparce on info dealing with the whole vanishing of these great treats. And on the Wikipedia page for Planters it is listed as discontinued and the reason being, "they were too delicious". I'm sure someone edited that who was in the same situation as me, wondering directionless in time and space contemplating the sudden disappearance of their most favoritist snack and the only logical reason they came up with was, "Well there is no good reason for them to have taken it off the market other then it being too damn tasty." And thus the Wiki was modified. For the people who passed by these scrumptious oddities (can you tell I'm running out of adjectives to describe these things? ), essentially a P.B. Crisp was some kind of cookie, though it's equal I have never found, shaped like a peanut shell and filled inside with mouth watering creamy peanut butter. The real tragedy in all this is that while P.B. Crisps had a brief but beautiful life, Nutter Butter continues to wreak it's havoc in the halls of Snack Foodom. And yet every 10 years or so I will try another Nutter Butter in hopes it will fill the void in my life created by the absence of P.B. Crisps, and then again remember how much I really despise Nutter Butters. Does anyone out there in the vast expanse of cyberspace remember these delicious morsels, as fondly as I do? Or am I alone in my quiet admiration? As always, the helpful Retrojunk has a small blurb about them in an article about discontinued food. And it is also where I stole the only known image in existence of P.B. Crisps. I think I might turn this into a feature. A whole series of "Seriously, WTF Happened to...", though I think I'm at my limit at trying to keep with weekly updated articles.